This is an updated guideline for the diagnosis and management of asthma, developed by the Saudi Initiative for Asthma (SINA) group, a subsidiary of the Saudi Thoracic Society. The main objective of SINA is to have guidelines that are up to date, simple to understand and easy to use by nonasthma specialists, including primary care and general practice physicians. SINA approach is mainly based on symptom control and assessment of risk as it is the ultimate goal of treatment. The new SINA guidelines include updates of acute and chronic asthma management, with more emphasis on the use of asthma control in the management of asthma in adults and children, inclusion of a new medication appendix, and keeping consistency on the management at different age groups. The section on asthma in children is rewritten and expanded where the approach is stratified based on the age. The guidelines are constructed based on the available evidence, local literature, and the current situation in Saudi Arabia. There is also an emphasis on patient–doctor partnership in the management that also includes a self-management plan. 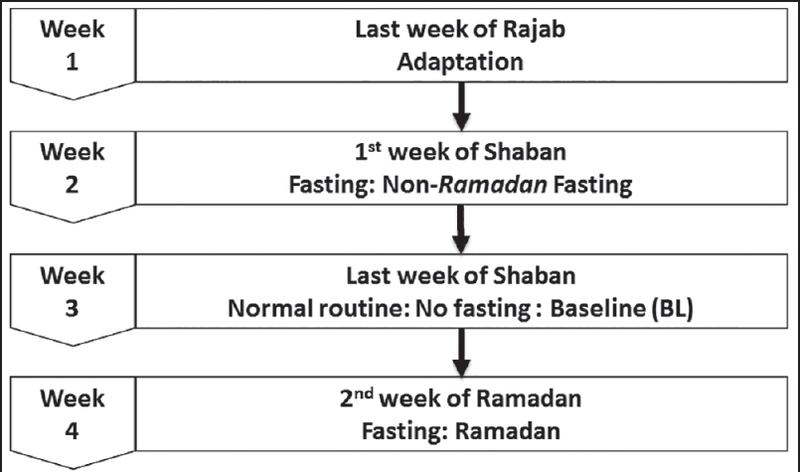 Aims: We hypothesized that if we control for lifestyle changes during Ramadan, Ramadan Islamic intermittent fasting (IF) reduces oxidative stress. This study was conducted to examine the effect of Islamic IF during and outside of Ramadan on the circadian changes in lipid peroxidation marker malondialdehyde (MDA) during and outside while controlling for potential confounders. Methods: Serum MDA concentration was measured in eight healthy male volunteers at baseline (BL), after fasting for 1 week before Ramadan (BL fasting), and during Ramadan. Blood samples were drawn at 22:00, 02:00, 04:00, 06:00, and 11:00. The participants were admitted to the sleep laboratory and monitored for 24 h on the day of the measurements. In the laboratory, each participant received meals of fixed compositions and caloric contents based on their ideal body weights. Light exposure, physical activity, and total sleep duration were uniformly maintained during the three study periods. Results: The participants had a mean age of 26.6 ± 4.9 years and a mean body mass index of 23.7 ± 3.5 kg/m2. No significant changes were observed in MDA levels and blood glucose during BL, BL fasting, or Ramadan. Conclusion: In this pilot study, under conditions of fixed sleep-wake schedules and caloric intake, Ramadan IF does not alter serum MDA levels in healthy subjects. Larger studies are needed to confirm these findings. Aims: The prognosis of nonsmall cell lung cancer with cavitation (NSCLC-c) is not well-known. 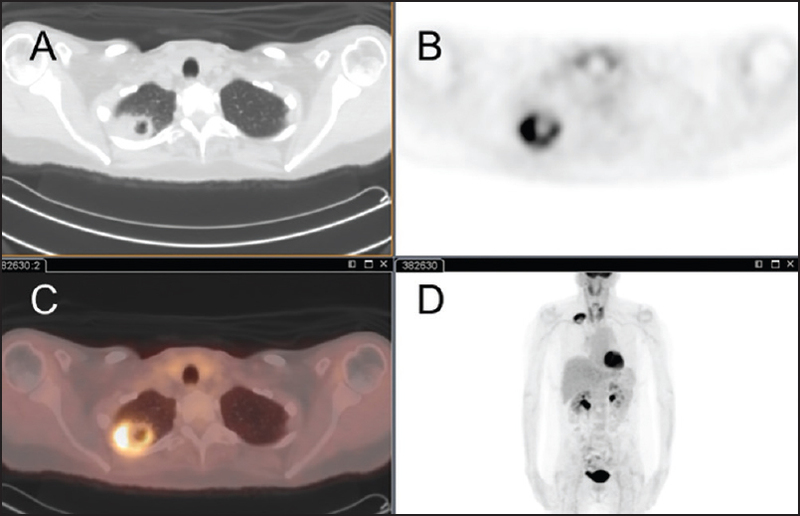 We compared the positron emission tomography/computed tomography (PET/CT) findings and survival data of patients with NSCLC-c patients with those without cavitation (NSCLC-nc). Methods: Between 7/2004 and 6/2007, cavitary lung lesions were identified in 46/248 patients undergoing fluorodeoxyglucose (FDG) PET/CT for lung nodule characterization or lung cancer staging. Within the same period, 40 of 202 patients with NSCLC-nc were randomly selected for comparison. The primary was assessed by location, size, cell type, and standardized uptake value (SUV). Disease stage was determined according to American Joint Committee on Cancer guidelines for lung cancer. Kaplan–Meier method was used for survival analysis and Cox regression to assess the effect of clinical and imaging variables on survival. 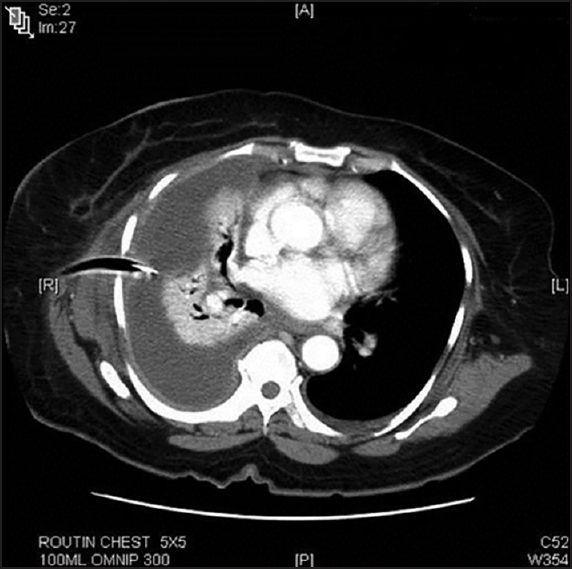 Results: NSCLC-c was found in 87% of patients that had a cavitary lung lesion at PET/CT. Squamous cell carcinoma, primary size and primary-to-liver SUV ratio differed significantly between NSCLC-c and NSCLC-nc, whereas age, gender, primary location, primary SUV, type of treatment, and disease stage did not. Median survival and overall 5-year survival were 19 months and 24% for NSCLC-c, and 31 months and 31% for NSCLC-nc, P = 0.23. Disease stage was the only predictor of survival. Conclusion: Cavitary lung lesions in patients undergoing FDG PET/CT harbor a significant risk for cancer. NSCLC-c is associated with squamous cell carcinoma, larger size, and greater FDG metabolism compared with NSCLC-nc, although these variables may not be predictive of survival. Nonetheless, PET/CT contributes to accurate staging and has an indirect impact on prognosis. Objectives: To evaluate the bacterial colonization and associated risk factors in patients with bronchiectasis. 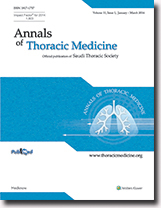 Methods: A total of 121 patients followed at the Bronchiectasis Unit, between 1996 and 2013 and diagnosed as having noncystic fibrosis bronchiectasis with high resolution computed tomography or multi-slice computed tomography were included in this retrospective study. The following definition of colonization was used for study purposes: Detection of at least two isolates of an organism separated by at least 3 months in a year. Results: Of these 121 patients, 65 (54%) were female and 56 (46%) were male. Mean age was 50.6 ± 16.1 years. Mean duration of illness was 20.3 ± 15.5 years. 43 (35.5%) cases had colonization. The major pathogens responsible for colonization were Pseudomonas aeruginosa (n = 25; 20.6%) and Haemophilus influenzae (n = 14, 11.5%). The stepwise logistic regression analysis showed a significant association between colonization and a low percentage of forced vital capacity (FVC%) and the presence of cystic bronchiectasis (P < 0.05). Conclusion: The following factors have been found to be associated with colonization in patients with bronchiectasis: Low FVC% and the presence of cystic bronchiectasis. Objective: Assessing the knowledge and awareness of the Saudi society about bronchial asthma in children. Methods: Structured questionnaires were randomly distributed to 1039 Saudi Arabians in May 2014 at Jeddah, Riyadh, and Dammam. 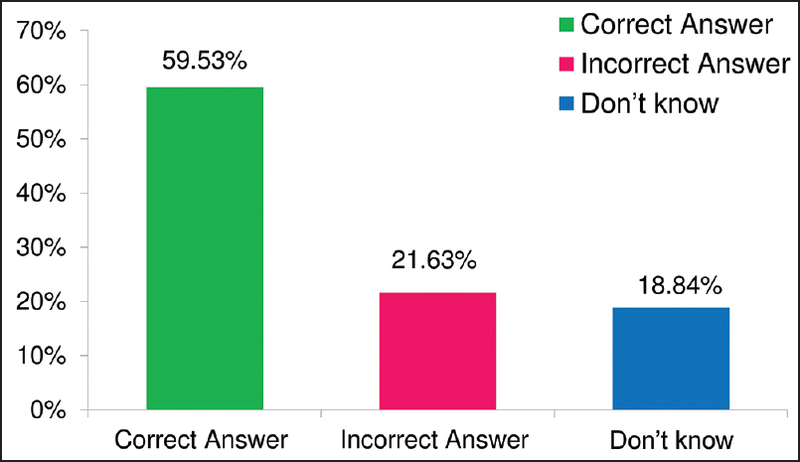 Results: The awareness of bronchial asthma questions showed that 67% of total sample thought that it could be a fatal disease, and only 13.2% thought that there is a difference between bronchial asthma and chest allergies in children. 86.1% thought that the symptoms of bronchial asthma include dyspnea and nocturnal cough, and 45.7% thought that fever, a runny nose and throat inflammation are not symptoms. 60.2% thought that infectious respiratory diseases may increase bronchial asthma progression. In addition, 40% thought that the use of antibiotics doesn't help in diminishing bronchial asthma complications, and some thought that the patient can stop medication after an acute asthma attack. 34.1% thought that inhaled medication for asthma doesn't cause addiction. Very highly significant results are shown between bronchial asthma knowledge and age, the level of education, marital status, and if the individual knows a person who suffers from bronchial asthma (P < 0.001). There are positive correlations between bronchial asthma knowledge and age, marital status, and level of education (r = 0.152, 0.150, 0.197), respectively. Conclusion: The study demonstrated that bronchial asthma knowledge in the Saudi Arabian population is insufficient, and efforts should be carried out to spread bronchial asthma management. Background: Videothoracoscopic surgery leads to general organ hypoperfusion by reducing mean arterial pressure, systemic vascular resistance, and end-diastolic volume index. Oxidative stress occurs as a result of hypoperfusion. Evaluation of the short-term effects of videothoracoscopic sympathectomy on serum ischemia-modified albumin (IMA), malondialdehyde (MDA), and nitric oxide (NO) levels in patients with primary hyperhidrosis was aimed. 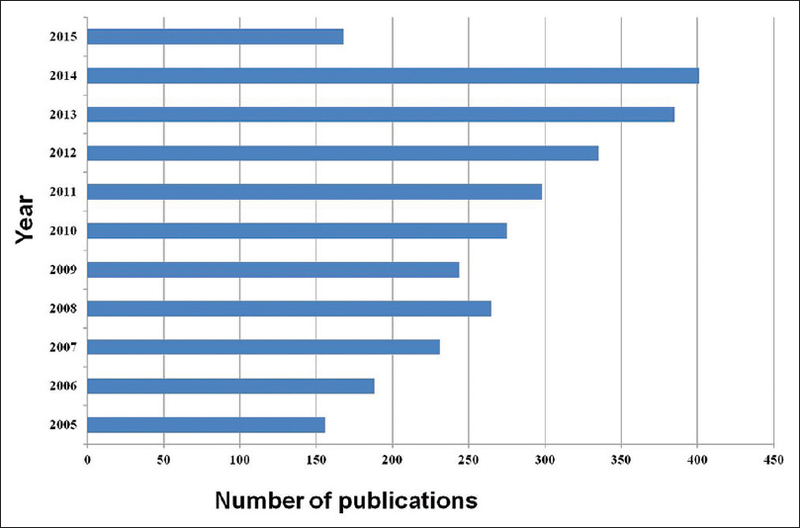 Methods: Twenty-six patients who underwent videothoracoscopic surgery were contributed in this study. Venous blood samples were obtained from these patients 1 h before and after the surgery. IMA, MDA, and NO levels were measured in serum samples by colorimetric methods. Albumin concentrations were also measured for each sample, and albumin-adjusted IMA levels were calculated. Results: Postoperative IMA, albumin-adjusted IMA, and MDA values were significantly higher compared to the preoperative values (P = 0.003, 0.027, 0.018, respectively). 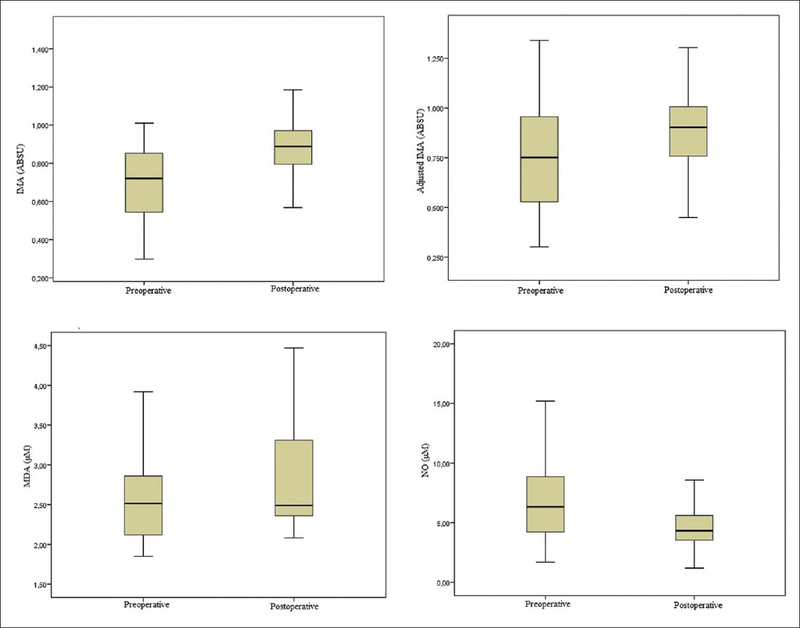 However, postoperative NO levels were lower than the preoperative values (P = 0.002). There was no significant difference between pre- and postoperative albumin concentrations, and there was no significant correlation between the parameters tested. Conclusions: We can conclude that elevation in MDA and IMA levels after videothoracoscopic surgery was caused by increased oxidative stress due to minimal ischemia-reperfusion injury after the infusion of CO2during the surgical process. Videothoracoscopic sympathectomy operation causes a decrease in NO production, and this should be taken in consideration when evaluating nitrosative stress in videothoracoscopic surgery. Background: Video-assisted thoracoscopic surgical decortication (VATSD) is widely applicable in fibrinopurulent Stage II empyema. 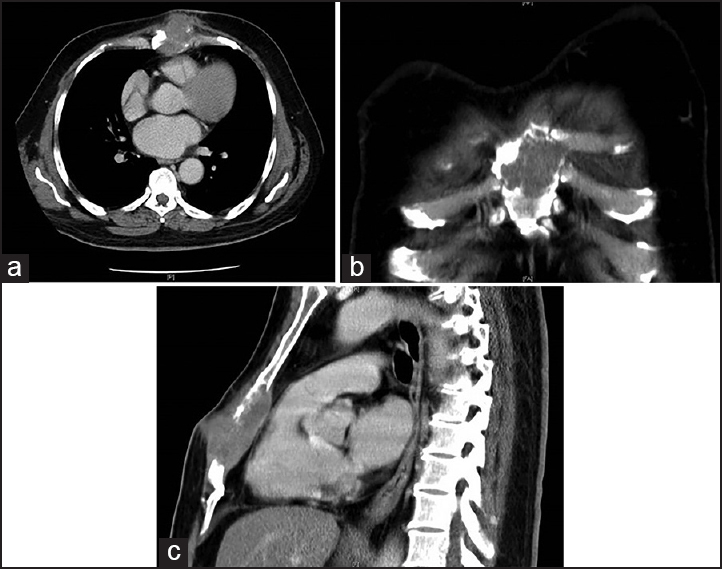 While, more chronic thick walled Stage III empyema (organizing stage) needs conversion to open thoracotomy, and existing reports reveal a lacuna in the realm of late stage empyema patient's management through VATS utilization, particularly Stage III empyema. We prospectively evaluated the application of VATSD regardless of the stage of pleural empyema for the effective management of late stage empyema in comparison to open decortications (ODs) to minimize the adverse effects of the disease. Methods: All patients with pyogenic pleural empyema (Stage II and Stage III) in King Khalid University Hospital (KKUH) (admitted from January 2009 to December 2013) who did not respond to chest tube/pigtail drainage and/or antibiotic therapy were treated with VATSD and/or open thoracotomy. Prospective evaluation was carried out, and the effect of this technique on perioperative outcomes was appraised to evaluate our technical learning with the passage of time and experience with VATS for late stage empyema management. Results: Out of total 63 patients, 26 had Stage II empyema and 37 had Stage III empyema. VATSD was employed on all empyema patients admitted in the KKUH. VATSD was successful in all patients with Stage II empyema. Twenty-five patients (67.6%) with Stage III empyema completed VATSD successfully. However, only 12 cases (32.4%) required conversions to open (thoracotomy) drainage (OD). The median hospital stay for Stage III VATSD required 9.65 ± 4.1 days. Whereas, patients who underwent open thoracotomy took longer time (21.82 ± 16.35 days). Similarly, Stage III VATSD and Stage III open surgery cases showed significance difference among chest tube duration (7.84 ± 3.33 days for VATS and 15.92 ± 8.2 days for open thoracotomy). Significantly, lower postoperative complications were detected in patients treated with VATSD in terms of atelectasis, prolonged air leak, wound infection, etc. Conlcusion: VATSD facilitates the management of fibrinopurulent, organized pyogenic pleural empyema with less postoperative discomfort, reduced hospitalization, and have fewer postoperative complications. VATSD can be an effective, safe first option for patients with Stage II pleural empyema, and feasible in most patients with Stage III pleural empyema. Sarcoidosis is a common disease that involve almost constantly the lung. Usually the onset is insidious, and symptoms are slowly ingravescent. Very rarely, as in the case here reported, sarcoidosis can cause an acute respiratory failure with acute respiratory distress syndrome (ARDS). 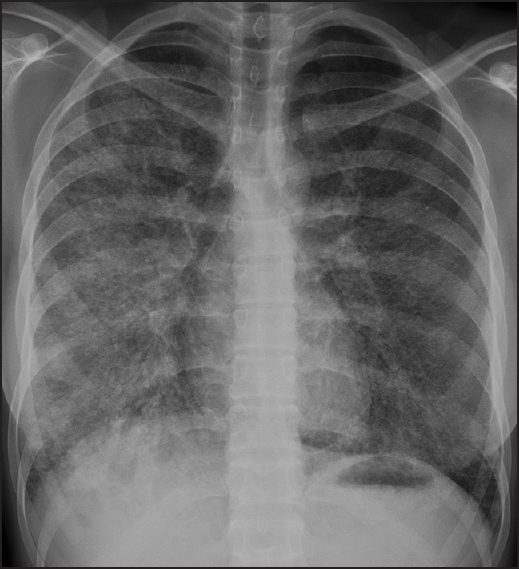 A 20-year-old girl from Pakistan presented for acute fatigue, fever, and cough with a chest X-ray displayed the micronodular interstitial disease. Despite of anti-tuberculosis therapy, ARDS developed in a few days requiring continuous positive airway pressure treatment. Examinations on transbronchial specimens obtained by bronchoscopy permitted to reach the diagnosis of sarcoidosis and steroid therapy improved rapidly clinical conditions. This is the first case report reported in Europe that confirms the rare onset of sarcoidosis as ARDS. Steroid therapy allows to cure rapidly this severe complication.